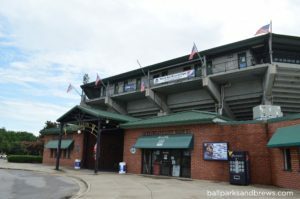 Ballpark Basics: A unique ballpark (sometimes good, sometimes bad). Ballpark Breakdown: Flying into Mobile we were shocked by the number of baseball fields that stretched out below us since we thought we were flying into strict football territory. However, we were happy to learn that Mobile has produced some of baseball’s most storied players including Satchel Paige, Ozzie Smith and Hank Aaron. 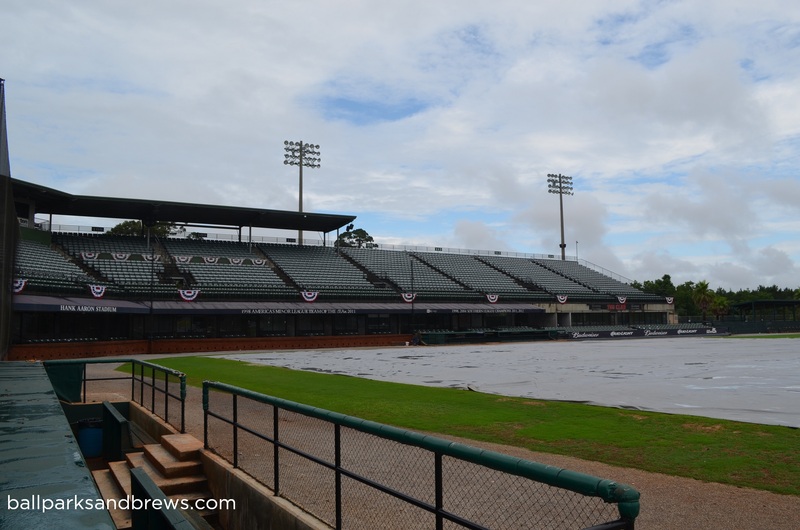 Unfortunately the game we were supposed to attend at Hank Aaron Stadium was rained out. 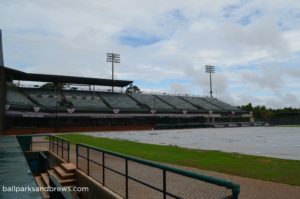 However, the nice staff from the Mobile BayBears gave us a tour of the ballpark the following morning before our flight out of town. 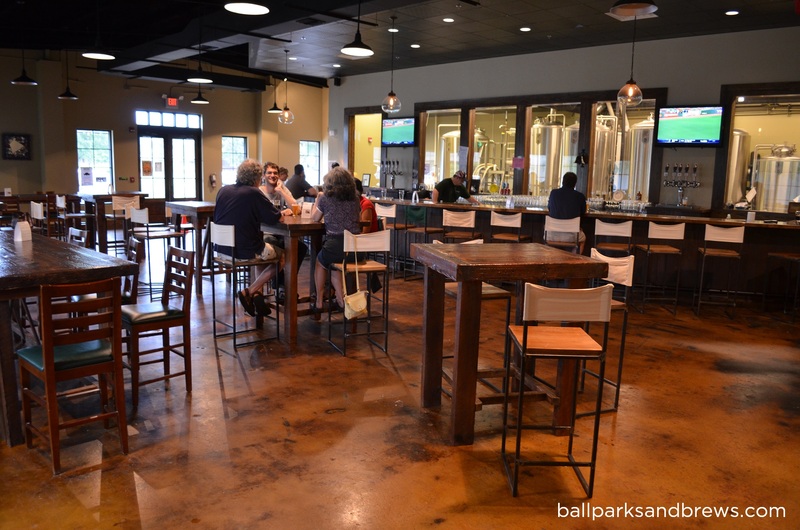 The ballpark is located a ways from downtown Mobile and is surrounded by parking lots (two things we hate) and they charge $5 for parking (something we really hate). However, the BayBears have done some things right. 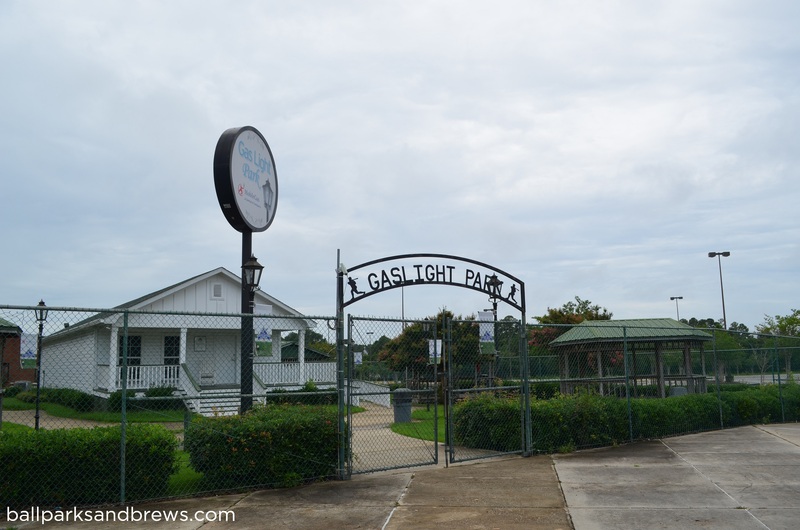 While we have complained about ballparks that are surrounded by asphalt before, Mobile at does a good job of incorporating the history of Mobile baseball throughout the park. Driving up to an empty ballpark it has all the styling of a classic grandstand from the outside, though built in 1997, the traditional architecture gives the stadium a classic, traditional aura. However, upon entering it is anything but. The first thing you notice is the club level. Typically situated behind the first section of seating, the club level is front and center at The Hank. They have placed the club level right up against the field, pushing the general seating area about 20 feet away from the action. Another aspect that is unfortunate about the park is that the concourse is set behind the club level so you can’t watch the games a you walk around the park. Easily the most interesting aspect of The Hank is the childhood home of the stadium’s namesake. Named after Mobile native and –true– MLB home run king, the team moved Hank Aaron’s boyhood home and is available to tour. This is worth the price of admission alone as they have stocked it with artifacts from throughout his life. 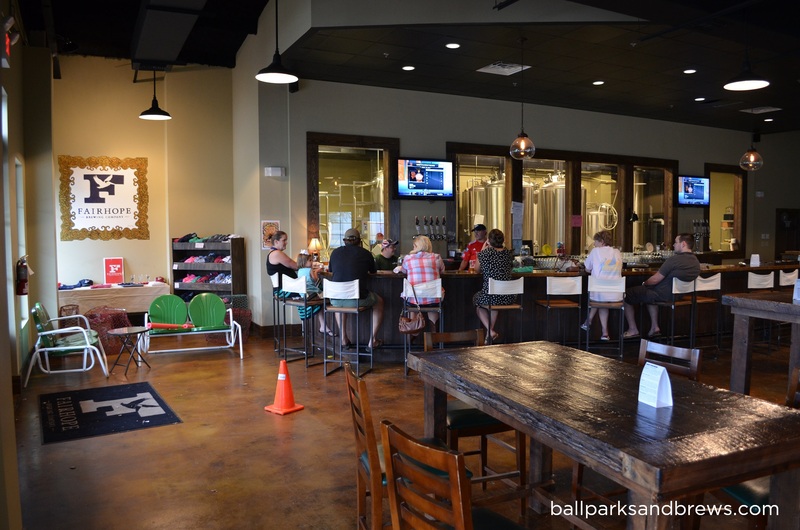 Another area where the BayBears have done a good job of showing the local flavor is in their craft beer selection. 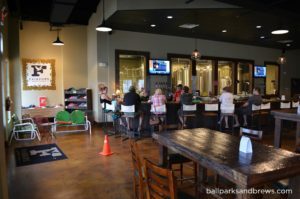 The have options from Alabama breweries such as Back Forty Beer Company, the Brew Stooges and Fairhope Brewing Co. While we were not able to catch a game at The Hank we were glad that we still stopped by just to see the Hank Aaron boyhood home. If you are in the area it is definitely worth a visit and hopefully you will have better luck with the weather than we did. Beer Basics: An instant hit with a big vision. 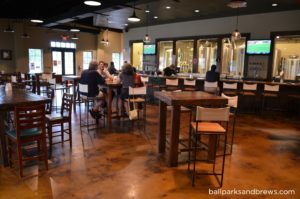 Located inside what is basically a barn, Fairhope is definitely focused on the brewing end of things as opposed to the restaurant/bar type of things. In fact, the only food you’ll find here is some snack mix, and you can pour your own water from a office style water cooler. A tiny basketball hoop in the corner gives you an idea of the long hours that have been put in to get Fairhope to where they are. The barn housing the brewery has a tan walls and a black ceiling that make it somewhat dark, but make the Edison bulbs over the bar that much prettier. 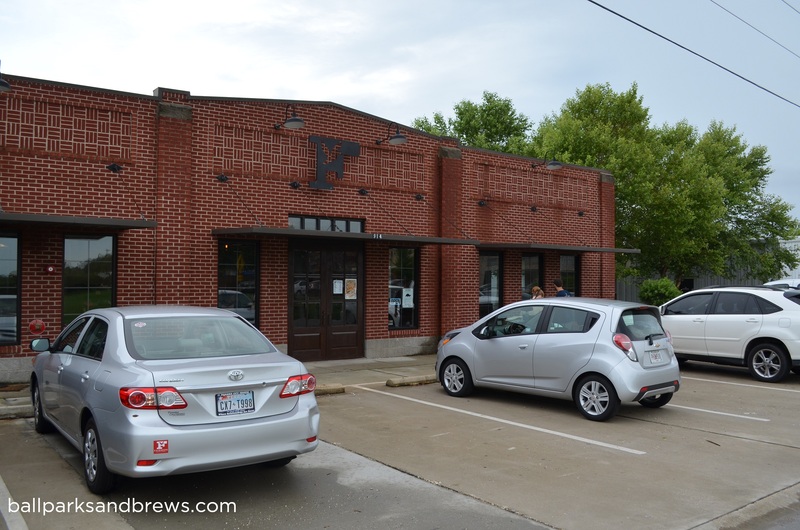 There is a long, curved, light wood bar with high bar stools with directors chair seat backs face six large windows that give a peek into their brew works. Additional wood high top tables are sprinkled throughout. 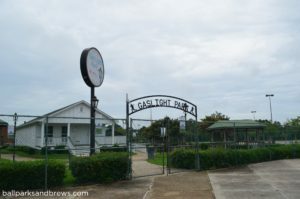 Despite being relatively new on the scene they’ve already got quite a group of friendly local followers, and three TV’s with MLB extra innings – so we were still able to get in some baseball even with the local game being rained out. Everyday Ale (3.8 ABV /14IBU) based solely on name, this one seemed a good place to start (the low IBU rating helped too of course). The Everyday Ale is light but still definitely gold in color with the least head or lacing of any of the beers on in the light range of our flight. Everyday is an American Blonde Ale that effervesces without being too crazy – although it gets pretty tingly if you hold this one on your tongue for a second). It has a earthy-wheat bouquet and a palate that starts light and ends up being pretty flavorful, with a wheaty build and a crisp finish. Section Street Wheat (5.0 ABV/21 IBU) Very light white ale color, with lots of lacing and none of the unfiltered haziness here. With a strong grassy aroma, Section Street is a yeast beer whose malts impart a light lemongrass-ish wheat flavor and is bubbly carbonated. This is the one we were told was also available at the Mobile BayBears Stadium. Fairhope 51 (5.6 ABV/36 IBU) Named for being the 51st incarnation of this recipe, Fairhope found success at 51. (Although this doesn’t mean there won’t be future tweaking). 51 has a brassy golden color to it and a good smell with a hint of sweetness that wasn’t in either of the first beers. That hint of sweet remains elusive, and though it might pop up at first blush, overall this one is hoppy and dry – a full flavored American Pale Ale. Painted Black IPA (7.0 ABV/72 IBU). As the name suggests, the Painted Black pours a dark chocolatey color and smells woodsy and of dark malts with some hints of citrus. The lacing is minimal, but it sticks around. Palate-wise this American IPA is smokey-woody and a bit tart. At first the hops are overpowered by the malts but then they punch through giving it a little kick toward the end. Lil’ Painted Black (5.5 ABV) The little brother of the beer above, the aroma is not as woody and just a tad sweeter than the original Painted Black. It pours equally dark with lots of had that lasts. The flavor is a tad softer, but the smoke is more pronounced, and while it’s still hoppy it doesn’t have as bit a bite at the end. 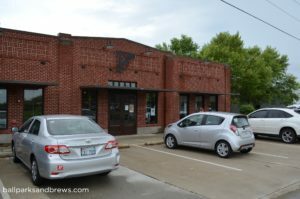 And this is a great spot to end on a good note and wrap up this review, as it was also Jim’s favorite of what Fairhope had to offer.